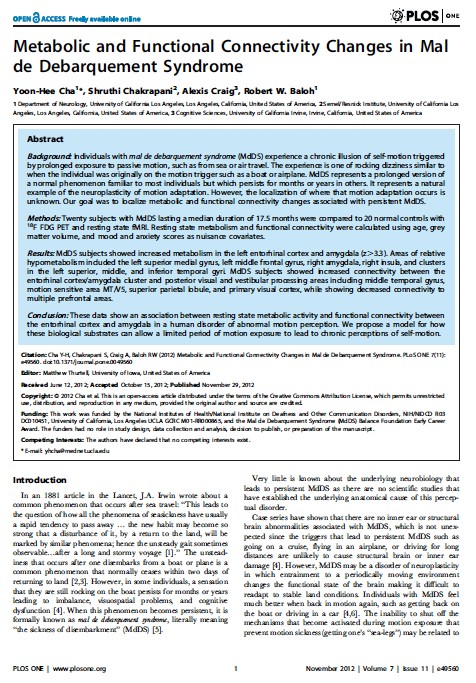 PLOS One has published an article by Yoon-Hee Cha, MD, Metabolic and Functional Connectivity Changes in Mal de Debarquement Syndrome. The Journal is a peer-reviewed, open-access journal and the article discusses current research, areas of the brain associated with MdDS, and future exploration needed. Individuals with mal de debarquement syndrome (MdDS) experience a chronic illusion of self-motion triggered by prolonged exposure to passive motion, such as from sea or air travel. The experience is one of rocking dizziness similar to when the individual was originally on the motion trigger such as a boat or airplane. MdDS represents a prolonged version of a normal phenomenon familiar to most individuals but which persists for months or years in others. It represents a natural example of the neuroplasticity of motion adaptation. However, the localization of where that motion adaptation occurs is unknown. Our goal was to localize metabolic and functional connectivity changes associated with persistent MdDS. The full article may be found on the PLOS One site. To read more research articles, please see the complete list of MdDS in the Biomedical Literature in the Professional area of this website.